Ready to gather up your friends and family and put a sizzle on the grill – but wish everything could come together automagically? 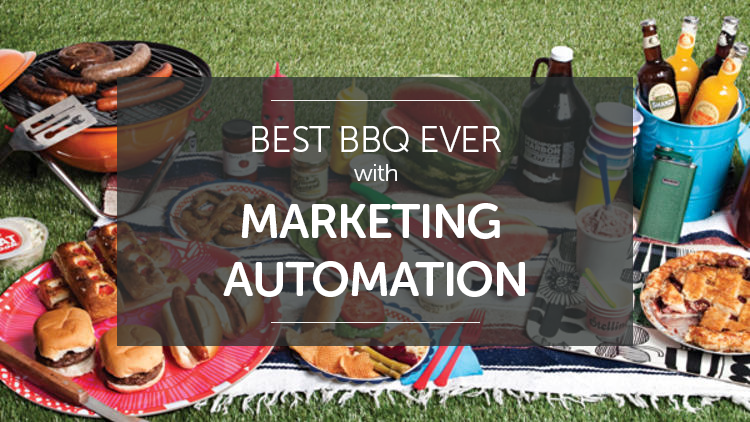 If your backyard barbeque ran on marketing automation, it could. When it comes to grillin’ and chillin’, the right guest list can make or break your backyard soiree. You want to invite the right mix of people, and make sure you don’t leave out anyone important. Since marketing automation dynamically segments people by their preferences, demographics, industry, title, activity level – basically any criteria you can think of – imagine how it could revolutionize the process of choosing your guest list. And, once your invite list was decided, sending out the invites would be just as easy. You have a lot of people in your close circle – so when it comes to getting the word out, it can be time-consuming to craft a personal message for every person. But, in a world where marketing automation ran your summer shindig, you could send a personalized invitation to your entire invite list – in a super efficient way. For instance, you could include personalized fields – like what to bring (drink, side dish, or app) based on the skill set of your guests. Everyone would feel like they received a personal invitation from you – boosting engagement with your audience – I mean getting more people to attend your party. In the meantime, you’d be freeing up your time to work on your tan, drive a few golf balls, hang with your kids, or whatever else you love to do in the summertime. Your barbeque can’t be legendary unless everyone raves over the spread – and that entails knowing exactly what your guests want. You have to know who’s vegetarian, who’s gluten-free, and who goes crazy for bison burgers. Who drinks beer, who sticks to cola, and who wants a frozen margarita. You probably know everyone you’d invite to a barbeque fairly well – but might not know those dietary details. But imagine if marketing automation was tracking your guests, updating their contact status when they became vegetarian, or tagging them when they indicated a preference for white wine over red. If your weekend barbeque ran like a business runs on marketing automation, you’d know your crowd’s preferences before they got to the party, not during – setting you up for a memorable event. Life gets busy, and keeping up with the lives of your friends and relatives can be tough. You don’t know who your cousin is dating (is it safe to bring it up?) and can’t remember the name of your buddy’s pet chihuahua. As you know, businesses using marketing automation have pristine notes and records of the contacts in their CRM. That means, when they call up a customer or prospect, the conversation can be picked up right where it left off – resolving issues or getting to the sale faster. Imagine if marketing automation could bring that kind of power to your barbeque. You could skip the awkward small talk and get right into conversations that matter, maximizing your time with the people who matter. I can’t say that I’ve ever seen any barbeque-related applications of marketing automation…yet. But there is one way that marketing automation can help make your barbeque legendary in the here and now. You probably don’t have marketing automation in place for your summer barbeque, but if your business runs on marketing automation, you have something better: You can actually step away from your business guilt free. While you’re away, autoresponders ensure that everyone who reaches out to you on your website receives a helpful message that directs them to the next step in your sales process or a where to find a solution to their customer service issue. At the same time, smart segmentation, tag rules, and lead nurturing all work together to send your contacts the right content and the right time – whether you’re in the office or not. When you’ve got marketing automation running behind the scenes, you can step away from your business and actually enjoy a summer barbeque. Spend time manning the grill, showcase your badminton skills, or instigate a cannonball contest in your pool. Marketing automation has you covered, taking care of prospects and customers. They won’t even know you’re gone.